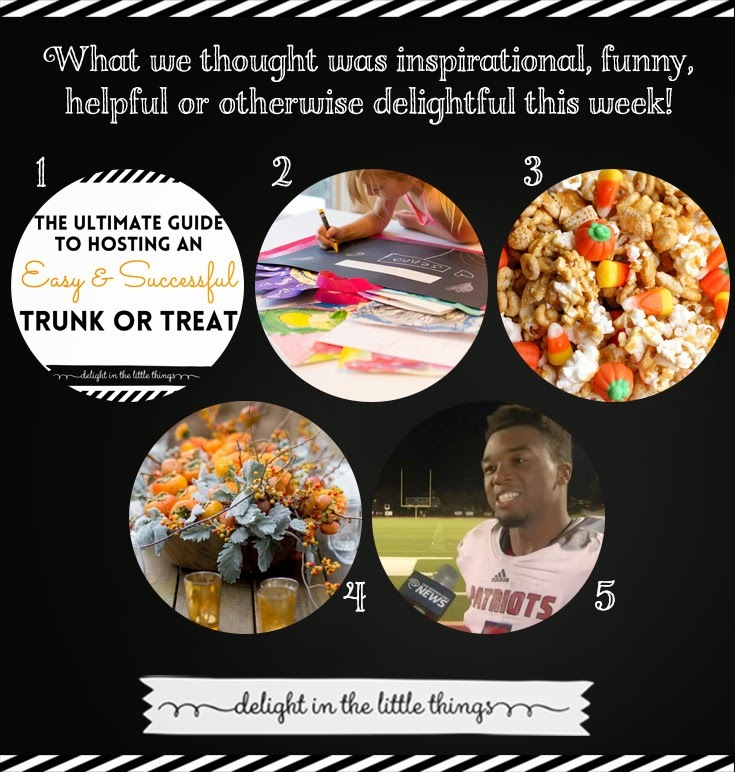 If you missed it, we created an Ultimate Guide to Hosting a Trunk or Treat yesterday here on our blog. This is a must read for all of you who are planning a trunk or treat for your organization or church. I love this great DIY for a child's art portfolio over on Modern Parents, Messy Kids. Bonus: It involves cute duct tape. Kristyn at Lil Luna shared a yummy recipe for a fall pumpkin snack mix. My girls will love this one, looks perfect for our family movie night. Cyd at The Sweetest Occasion shared a gorgeous fall centerpiece using persimmons! This makes me super excited about a certain persimmon tree near where we are building our new house. Want to make your own? Check out the DIY and even more gorgeous photos by Anna Costa here. Apollos Hester is winning and you will feel that way too after watching his motivational interview. We are spending the beginning of this weekend at the Children's Boutique Resale in Winston-Salem and hosting a giveaway for a free monogrammed hat. So if you are local, come on out! We'll be here Friday from 9-2 pm, but the sale lasts until 4 and then has a half-price day on Saturday. The rest of the weekend will definitely include some relaxing and family time, plus I really, really NEED to clean out a certain little person's closet. What do you have planned? Hope it's a good one!